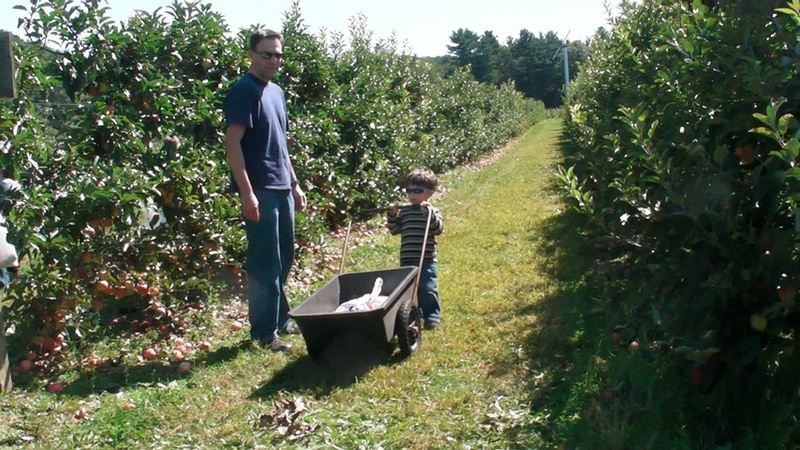 The First Week of School, The First Cold of School, and Apple Picking! Well, we made it through the first week of classes here at the academy. This week was also my first week back at work. Of course, to start it all off, we had the first cold of school. It is somewhat inevitable with all the little kids being back at Tiger School/daycare. Luckily this cold seemed to last only about 48 hours, which is not bad as far as colds go. Seth came home last Friday with a fever and a runny nose, so we took it easy Friday night and Saturday, and he was feeling better in time for our gathering on Sunday to commemorate my grandmother's yahrzeit (anniversary of her death). We had a nice day remembering her with Geema, Michael, Aunt Michele, and Uncle Bill. Seth also got to harvest his "potatoes in a bag" that Aunt Michele helped him grow - success! Lots of potatoes! Then Sunday night, Jason got the cold, then Monday morning Evan had it, and by Monday afternoon I was down for the count, too. A big thank you to Grams and Geema for braving the sick house to help us with the boys! A visit to the doctor with Evan on Monday confirmed it was just a cold and not an ear infection, and me staying home from my first morning of work to sleep capped off that fun! Luckily, by Wednesday, we were all feeling better and back to work and daycare, so that wasn't too bad! Jason's first week of classes went pretty well, and my first week back at work went well, too. It seemed easier to go back this time than when I went back after my maternity leave with Seth. This time, I had twice as long, which is great. Evan is eating solid food, so he isn't only depending on my breast milk. This time, instead of having to deal with pumping and bottles, I am lucky enough to be able to go over to daycare twice a day to just nurse Evan. He is on a good schedule, alternating between eating food, napping, and nursing when he wakes up. He does this routine twice a day, and I head over to nurse him after his nap. This is working well, and I am getting my exercise running across the street! I was worried Seth might be distracted by my presence over there, but I needn't have worried, as he has barely looked up from playing with his friends when I've popped over. Evan, on the other hand, though doing fine at daycare and very well cared for, is having some separation anxiety. When I arrive to nurse him, he starts crying, as if he just realized I wasn't there and that he missed me. He calms down and nurses, but then when I leave, he starts crying again. Cue tugging at the heartstrings. They tell me that he settles down quickly after I leave, and I know it is normal. I am grateful to be able to go over and nurse, and I know he is okay. He is doing a good job of keeping up his nap schedule, which is great. Seth loves having Evan with him at daycare - he likes to play with him and make him laugh. They tell me that whenever Evan sees Seth, he smiles and laughs and gets really happy. This makes us so happy to think about. I have a good schedule - Mondays off, a split schedule (morning and evening) on Tuesdays, and a regular day on Wednesdays, Thursdays, and Fridays. On Monday, Seth also started his new session of gymnastics - Grams was nice enough to take him as I was sick. This is the first time Seth is doing a class where the parents do not go through the activities alongside him; instead, we watch through the window. The activities in this Mini Tumblers class are the same as in the old Tiny Tots class, but with just one teacher and no parents. We could tell Seth was ready for this, but of course, we were a little nervous about his safety. Grams was happy to report that Seth did a good job and had fun. He was great about following directions, and there were only a couple times when it sounds like he tripped or fell, but nothing serious (knock on wood). I guess part of parenting is allowing your child to become more and more independent, but that doesn't mean it's always easy! On Thursday, our new session of Music Together started, and that was fun for both boys. Again, thanks to Grams for coming along to class. Seth enjoys class, and Evan is starting to listen and watch and bop along. It is fun to think that Seth was just a little older than Evan when he started music class, and now it's second nature to him. Everyone in class always laughs when the teacher asks every week what we call the ending tone of a particular song, as Seth is always the first one to blurt out "Resting Tone!" He was good at spotting the pinker raspberries, and we just had a great day. Jason and Seth got to take a little wagon ride around the property while I nursed Evan. We had so many apples that we decided to make one apple-raspberry crisp for us, and one apple crisp for Seth to take to Tiger School. Seth has been studying about apples for the past few weeks, so we thought this would be perfect. I checked with his teachers, and they were excited about it. So, Seth will have a very exciting Show and Share tomorrow when he brings the apple crisp in! Sunday we were treated to a visit from Auntie Lissa and Max, and Grams. Auntie Lissa and Max just moved to New Jersey for Max's new law job, so we are very excited to have them so much closer for a couple years. They were coming to CT in the morning to see Max's sister, so they decided to come see us for the afternoon. It was a great visit, and we are so excited for lots of future visits! It is always great to see them, and the boys have a great time with them. Max was great and went outside to run around with Seth. He had a blast and I think they played with every ball we own! We all enjoyed apple-raspberry crisp together and had a great time! We look forward to seeing them again soon! One of the cutest videos we have of baby Seth is when he was about four months old and Auntie Lissa was tickling him with his Peek-a-Boo Kitty - I'm sure we'll have many more cute videos in the future! Lately he's really been shrieking and growling - he wants to get in on the conversation! You can tell he's verbalizing in his own way! From time to time, he will wave at us if we wave at him. It is more of a pumping back and forth of his hand and arm, but we wonder if we'll get a real wave soon! Sometimes he likes to tell us that when Evan grows up, then he will be "another Seth!" Between the names of real towns, and the names of Dr. Seuss towns, Seth came up with his own town name that he uses a lot: "South Hartford!" When Seth is tired or hungry, we all joke that he needs "more energy and gas." Seth says this a lot! We started this ritual of saying "Thank you for a wonderful day" at the end of every day. Seth always says it back to us - so cute! Grams told us that she asked Seth the other day if it was okay if they walked across the grass, which was a little wet, and he said "It's okay with me if it's okay with you!" After we went apple picking, Seth was talking about apple crisp and apple pie, and he told us how you could also make raspberry crisp and raspberry pie. Then, as there had also been corn at the orchard, he told us "Did you know you can make corn pie and corn crisp?!"